The layer of cold, freezing winter has engulfed the land. We are hiding away in the cozy cocoon. Once in a while, we are shedding away the covering of blanket and stepping out of the house. The crisp, frosty air turn our cheeks blushing red and tickles the nostrils. Still we stand brave and handpick the fresh produce to refill the empty pantry. The site of bright, shiny vegetables is a bit comforting and cheering in this biting cold weather. The local farmer’s market is beaming with vibrant colors of winter produce. The delicate rays of sun cast a lustrous coating over the vegetables making them look garden-fresh. From tiny red radishes, green leafy vegetables, long red carrots, peas to purplish turnips we stuffed them all in the carry-bag. Shalgam aur Matar Ki Sabzi is our ode to nature’s bounty during this bitterly cold weather. 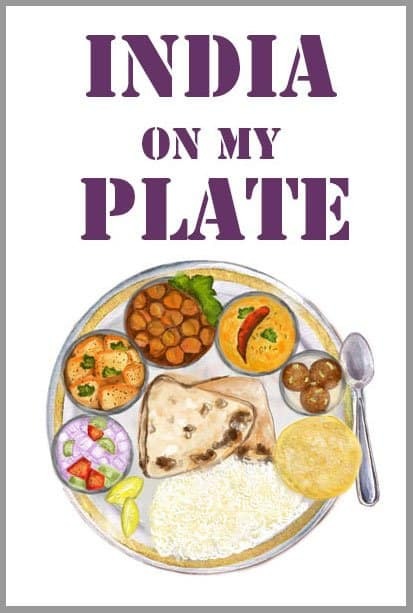 Shalgam aur Matar Ki Sabzi is another Indian curry. 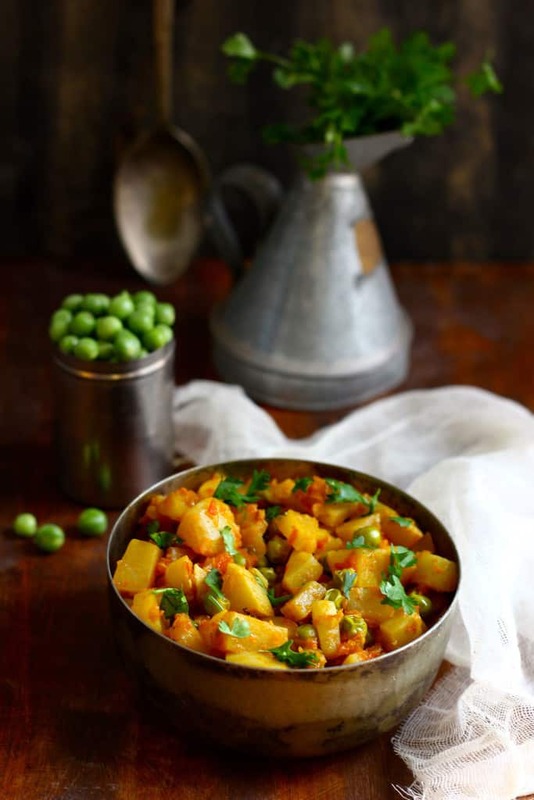 The turnip is cooked with fresh green peas in the routine onion and tomato masala. The pressure cooker can also be used to cook the curry. But we have stick to the old school method of slow cooking to make Shalgam aur Matar Ki Sabzi. 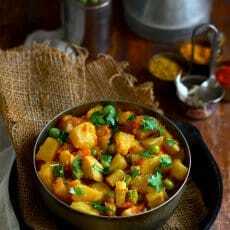 The turnips absorb the flavour of the spices while simmering. In turn, each bite of turnip turns out succulent and full of bursting flavours. The overpowering spices are kept at bay instead a dash of Garam Masala (see recipe) is enough to spice up the flavour of the dish. 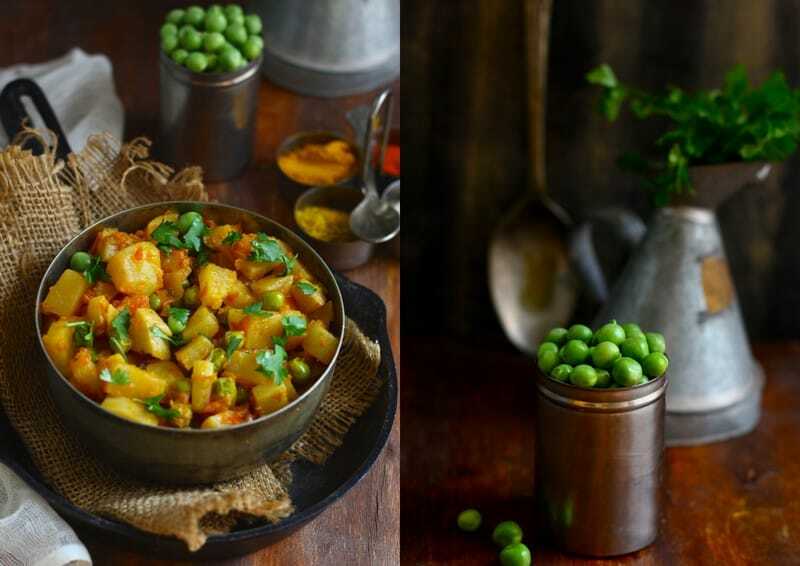 Shalgam aur Matar Ki Sabzi is turnip and green peas Indian-style stir-fry. Learn how to make shalgam ki sabzi in few simple steps. Finely chopped coriander leaves to garnish. To prepare Shalgam ki Sabzi, first peel the skin of turnips. Wash the turnips and pat dry with a clean kitchen towel. Chop the turnips into equal size cubes. Next make paste of chopped onion, green chili, ginger and garlic in mixer. Use little water to make paste if required. Set aside the paste till required. Next make a coarse paste of tomatoes as well. Heat the cooking oil in a heavy bottom cooking vessel. Add the bay leaf in hot oil and once the aroma of bay leaf is released add the onion paste. Fry over medium heat till the paste leaves the sides of the cooking vessel and the raw smell wafts aways. By now the onion paste would have changed color to deep brown. Now, add the chopped tomatoes, salt, turmeric powder, red chili powder and coriander powder. Stir to combine and continue cooking the spice mix on medium-low heat till the mixture comes together and starts leaving sides of the pan. This usually takes 5 - 10 minutes. 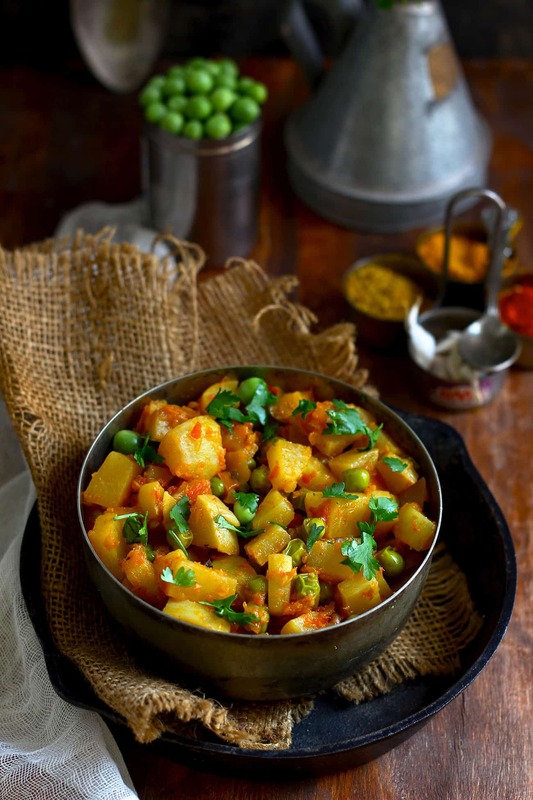 Add the chopped turnips along with the peas and mix to coat the vegetables with the masala. Add garam masala and stir to combine. Add approximately 1/4 Cup of water and stir well. Cover the cooking vessel with the lid and cook the turnips over low heat. Turnips take a bit longer to get cooked through. In between open the lid, stir the vegetables and check for doneness. Once the turnips are cooked through, turn off the heat. 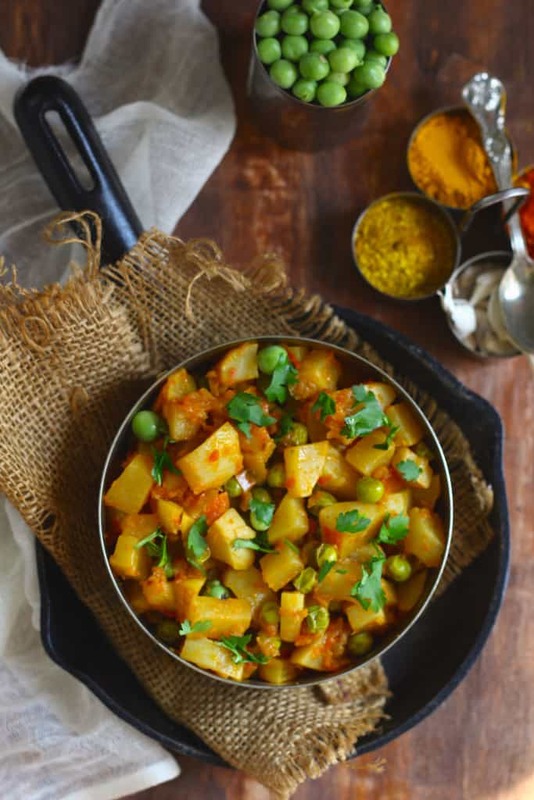 Serve Shalgam aur Matar Ki Sabzi warm with Phulka or Paratha.